Naturally Safe and Durable. BPA & PVC Free. 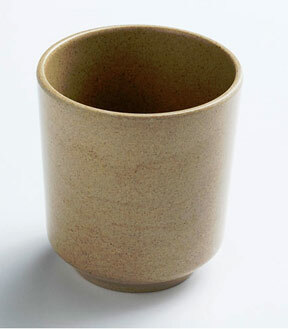 A safer natural fiber drinking cup that is safe for people and better for the environment. It looks and feels like plastic, but is made from a 100% natural fiber material derived from rice husks. These plastic-like dishes are a safe and practical alternative to traditional versions. They are super thick and virtually unbreakable, yet remain all natural and 100% biodegradable. Able to withstand high heat, be washed in the dishwasher, and used in the microwave, these cups will even outperform many of those regular plastic versions. Help reduce waste by choosing a more environmentally friendly way to feed your kids. A shorter cup, that is not too wide. This drinking cup is easy for small hands to grab and drink from. It is small enough that a little one can use it easily, but large enough to provide the perfect amount of liquid for drinking. It is totally non-toxic and safe, so you never have to worry about chemicals mixing with your child's drink. It holds up to 6 ounces of fluids and features thick, durable construction that will stand up to all kinds of abuse. Rated for hot or cold liquids this plastic cup is able to be safer and more practical at the same time. Little Husks Drinking Cup - A safe and practical way to feed your children. Made from a food by product that would otherwise be destroyed, these plastic cups are an environmentally friendly alternative to traditional kid's dishes. 100% Biodegradable. Order Yours Today!